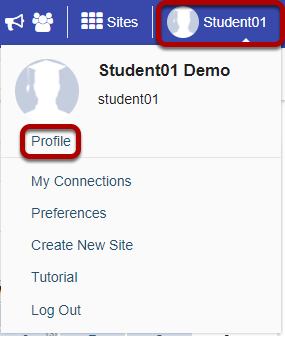 Sakai Community DocumentationSakai 19 User Guide (English) ProfileWhat is the Profile tool? The Profile tool contains basic user information, including names, and other optionally displayed information. Your Profile is available in all of your sites throughout the system. It contains information about you, such as status messages, your photo, biography, contact information, social networking information (e.g. Twitter integration), connections, notification preferences, and privacy settings. Some institutions update fields in the Profile automatically when user accounts are created. Typical institutional updates include the user photo and email address. All Profile fields are optional. Note: Some Profile options may be locked or unavailable depending on institutional settings. To access this tool, select Profile from the Tool Menu in My Workspace. Or, select your username/photo in the top right corner. When the dropdown menu appears, click on Profile. Prev: How do I delete a PostEm feedback item? Next: How do I set up my profile?